Alex invited some friends over... friends he hoped would appreciate a causal evening of playing with dangerous things, like knives and swords, eating a delicious and moist cake, and watching The Doctor. The piñata turned out to be an unexpected bonus surprise from a sister who loves a bit of danger and fun too. 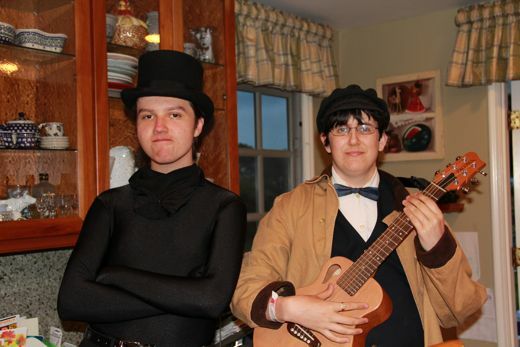 Yes, that's Alex, the man in black. All black. This was one of those wonderful birthdays when dreams come true... like getting his first Morphsuit. To quote Alex: "Everything is better in a Morphsuit. Except for the dapper blue and yellow tie Annie knit for him, Alex spent the evening blissfully invisible. Bow ties are cool. Name that Doctor. After looking over pictures of the evening, it occurred to me I had all of the makings for a nifty tutorial. 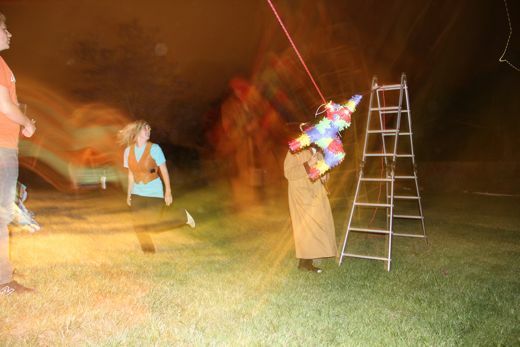 A step by step lesson in how to destroy a piñata. While broomsticks and baseball bats may be sufficient, it is possible to approach the task with profoundly greater, and more amusing, destructive force(s). Roughly translated we are singing: Hit it, hit it, hit it... don't skip a beat, or you'll lose your way. You hit it once, twice, three times, and your turn is over! 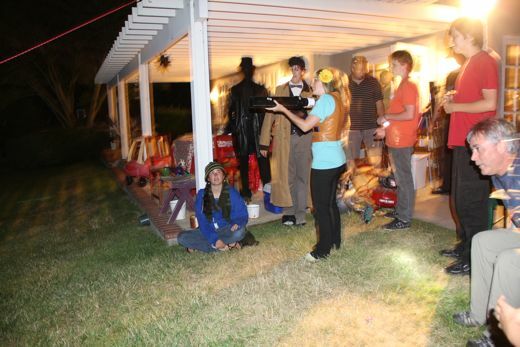 You can see Michal, Gabe, Suki, even Homer, standing clear, because Maria really did ¡dale! 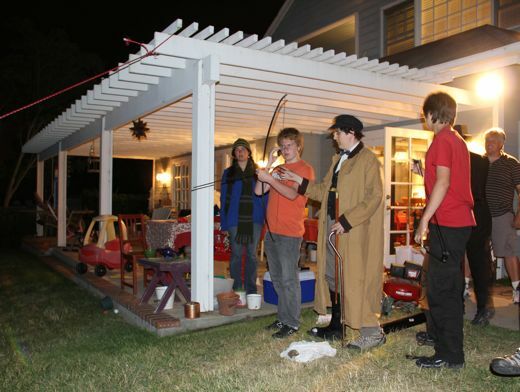 Invisible, armed with the beautiful walking stick he received from William, Alex approaches the piñata. 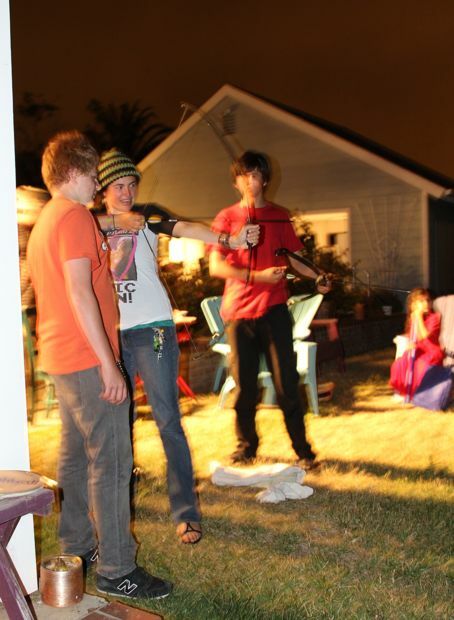 The advantage is Alex's: he can see the piñata, but the piñata cannot see him. 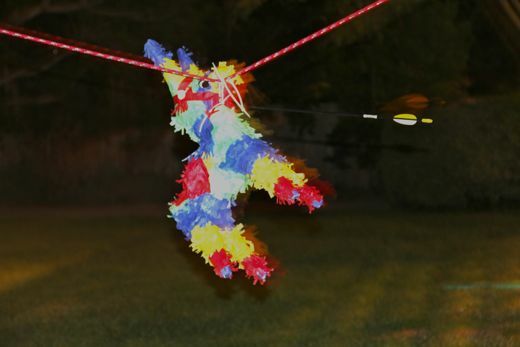 It is a cunning strategy, yet the piñata endures. So. 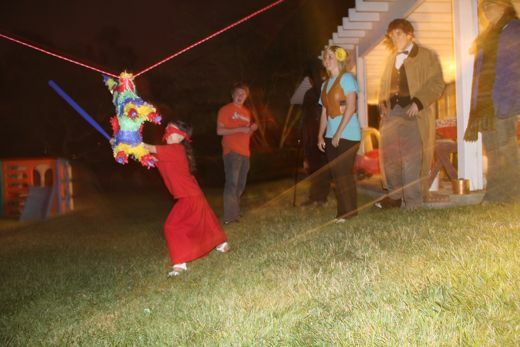 If your piñata survives the bat, and the cane, then bring out the bow and arrows. With a few tips from Eli and Max, Gabe prepares to take aim. Caution: It is important to remember when pointy projectiles are being used everyone must stand behind the archers. 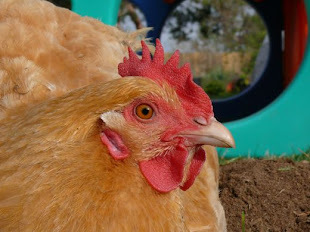 Chickens, cats, Homer, Maria, everyone was kept well and clear of flying arrows. 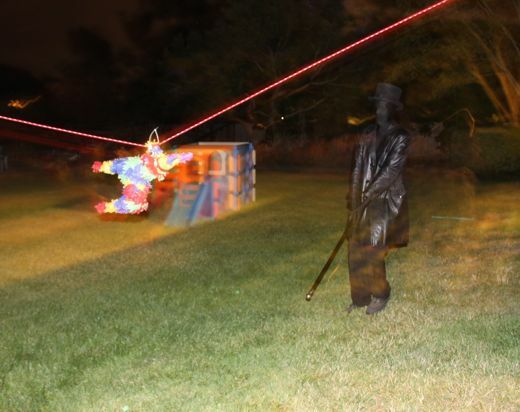 The flash of the camera is giving this some light, but shooting arrows at a swinging piñata, at night?... not easy. 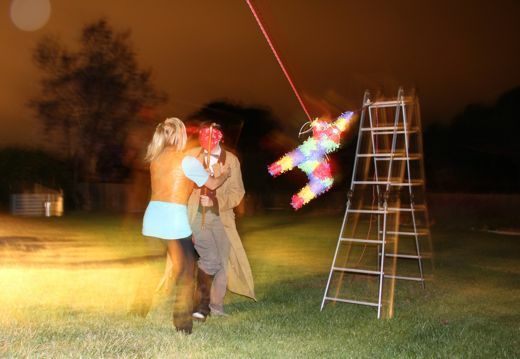 Max hit his target, and it was likely a fatal blow, but it wasn't enough to bring the piñata down. 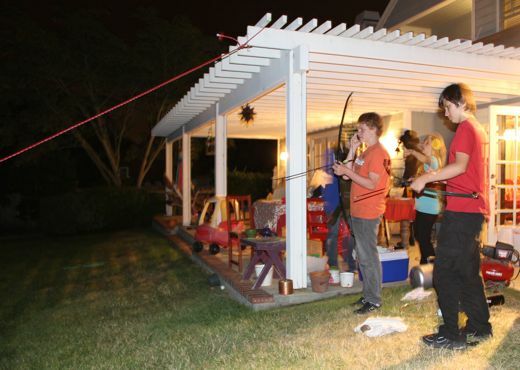 Archery may not be a good way to bring down a piñata, but it's fun just the same. I think we need to re-visit this activity later this summer. Note to self: Order more straw bales. So, naturally we brought out the T-shirt cannon. Ours is really only a small prototype, and in all honesty we did not load it with T-shirts. Eli is loading a pine cone, with dishrags for wadding. Caution: It is important to remember when cannon prototpyes are being used everyone must stand behind the canon. Chickens, cats, Homer, Maria, everyone was kept well and clear of flying arrows pine cones. If you do not happen to have a T-shirt cannon prototype available, I suppose you could try a slingshot made of surgical tubing, or even a good softball pitch, using either pine cones or softballs. Just be sure everyone is behind the pitcher! In the end, fatigued and craving chocolate, we reverted to tradition. 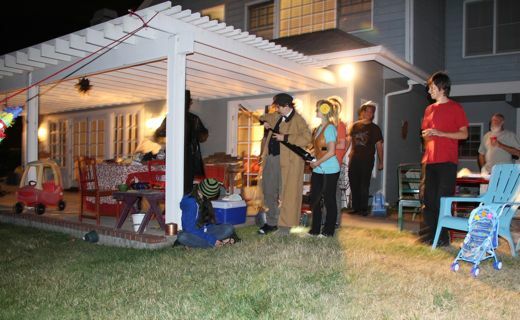 Eli was blindfolded, spun repeatedly, then let loose armed with a wooden stick. Eli brought the piñata down. Unfortunately, down is not necessarily the same thing as burst open! And if after hitting, shooting, canonning, arrowing, kicking, stomping, shaking, and clawing at the piñata, it refuses to surrender the candy... then grab a saw, or other cutting device and rip it open! 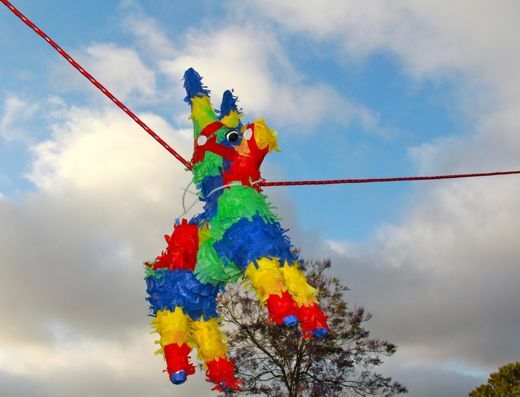 And thus, we conclude our "informative" how to take down and burst open a piñata. It has been a pleasure to share this knowledge. 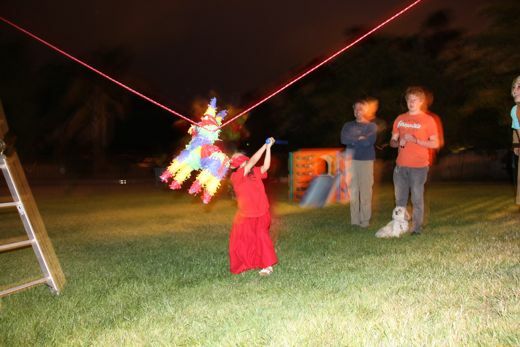 I think pinatas are notoriously tough! Maybe they should make car bumpers out of pinata material. Just like the v-dub commercial ... You have such wonderful fun birthday parties! Maria came up with a great way to celebrate, and it looks like everyone had a really good time. YES! You needed rockets! Holy cow that looks like fun...and swords?! I gotta get me a sword! 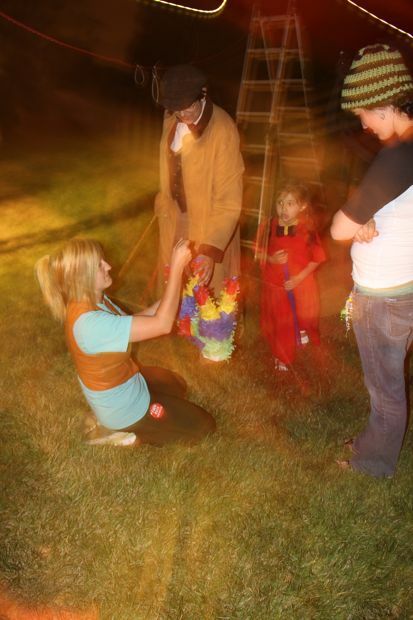 We love pinatas too. Glad you had a wonderful birthday party and thanks for sharing it with us. This looks like a pretty violent event! "Violent?" Only if you happen to be a paper donkey! Okay, I have heard a couple of VW commercial references... time to YouTube that! Thank you for Alex's birthday wishes. He enjoyed his celebration. Obviously we have a knack for making an event out the littlest thing... who knew there were so many ways of getting to the chocolate? !